1.9.2: James Roland Kyle, Jr.
Earl Lee Brooks was born on August 11, 1929, in the Cotton Hill section of Lynchburg, Virginia, to Eldridge and Mattie Brooks. Earl was the oldest child; he had four younger sisters. His parents worked in a textile mill. Later the family moved to “the county,” to Fairview Heights which was not part of Lynchburg at that time. Earl attended Brookville High School and then joined the United States Army where he served for only eighteen months. Hard times—both of his parents had health problems—required him to return home. Because he was the only son, he was released from the military and given an honorable hardship discharge. The year was 1948 and on his return home Earl married the love of his life: Dorothy Marie Riley. She was born and raised in Lynchburg. Their marriage of forty-five years would produce five children—Judy, Hilda, Earl Jr., Donna, and me, Ervin. Ervin Lewis Brooks was born on December 23, 1956, the youngest child of Earl and Dorothy Brooks. The family lived in the Perkins Park area of Fairview Heights in Lynchburg, Virginia. 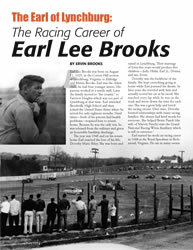 Ervin spent most of his adolescent years helping his father in Brooks Garage during the week after school and racing on weekends. His youth was centered around the sport and led him to become the racing historian of the family of five siblings. He graduated from E.C. Glass High School in 1976. He is employed by Shibuya-Hoppmann as an assembly technician and owns and operates Be a Star Karaoke. His hobbies include the history of racing and old country music. He and his wife, Cindi, have one child, Gina Brooks Osborne.